Earlier this week, the temptation to write SLU off as a non-factor in the A-10 was quite strong. 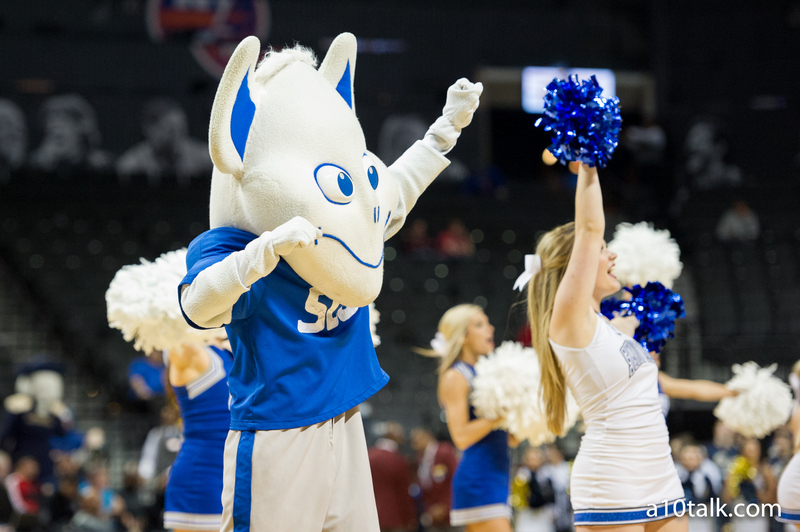 After starting conference play 5-0, the Billikens promptly lost 4 straight. Heading into the ArchBaron Cup, SLU looks beaten, defeated, and beset by injuries. SLU had played all year with a narrow margin for error, and their struggles making layups and free throws finally overwhelmed their strengths. Given where expectations, the situation had reached an almost Crewsian level of bleakness. Yet, with only 7 scholarship players active, and Javon Bess hobbled, SLU played one of their best games of the year, winning 73-60 over the Flyers. Senior DJ Foreman led the way with a transcendent performance, scoring 17 points on 7-10 shooting and pulling down 7 rebounds. Jordan Goodwin and Tramaine Isabell combined for 9 assists and only 2 turnovers, and kept the Billikens offense running smoothly. Fred Thatch Jr. delivered perhaps his best game of the season, scoring 12 points, hitting a couple of threes, and playing smothering defense, highlighted by a thunderous block of Dayton star Obi Toppin. SLU’s defense completely shut down Toppin and Josh Cunningham, holding Cunningham to shooting under 50% and Toppin to 2-6 from the field. With the Dayton game, SLU reminded people that they will not be a team that opponents will want to face in the A-10 Tournament. It’s almost impossible for SLU to win the regular season title; they’d have to win out and everything else in the A-10 would have to devolve into a fiery ball of chaos(actually fiery ball of chaos seems par for the course for the A-10). It’ll be an uphill battle for SLU to even finish in a top 4 position and get the bye. However, the Billikens still have a top defense, a few players who are capable of scoring at a much higher rate than they currently are, and, of course, Javon Bess. Once Demarius Jacobs and KC Hankton recover from their injuries, they’ll provide much needed depth. Hankton has proven to be an effective stretch 4 so far, and has shown some toughness on the offensive boards. Jacobs has struggled this year, but he has a lot of offensive talent. If he plays with some confidence, he gives the Billikens a dynamic slasher who’s a threat from deep. It’s not out of the question that this team can make a strong run in Brooklyn. Against Dayton, Travis Ford’s team looked strong, tough and fully committed to the concept of Team Blue. If SLU isto make a run, they’ll have to make more free throws, make their layups and get healthy. None of those things are automatic with this team. But if everything comes together, watch out. If you are inclined to be negative, this league is a dumpster fire. If you’re positive, you can say ‘on any given night.’ Kellan Grady pops a knee, Davidson is done. Dayton plays six guys. Rhode island three. Injuries have killed the Fightin’ Martelli’s again. Mason’s OOC record shows how fragile they are. Duquesne is streaky. Saint Louis has basketball-skill challenges. All we do know if Umass and Fordham will be in the PIG (play in games) come Brooklyn.